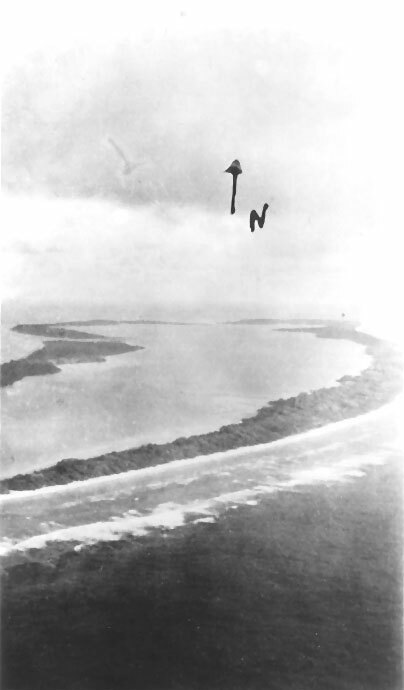 This U.S. Navy photo is the only picture known to have been taken of Gardner Island during the 1937 search for Amelia Earhart. The photographer is unknown, but this print of the photo, obtained from an archive in New Zealand, is inscribed “U.S. Navy (pilot) July 9, 1937” on the reverse. That is the date the three aircraft from U.S.S. Colorado flew over Gardner Island. The senior aviator on that mission was Lt. John O. Lambrecht. The handwritten north arrow points due west.